Resistance Ecology is back for the third year in a row! We are excited to invite you to the 3rd Annual Resistance Ecology Conference. The conference will be held once again at Portland State University in Portland, OR (on the occupied territories of the Multnomah Chinook), the weekend of June 12-14, 2015. 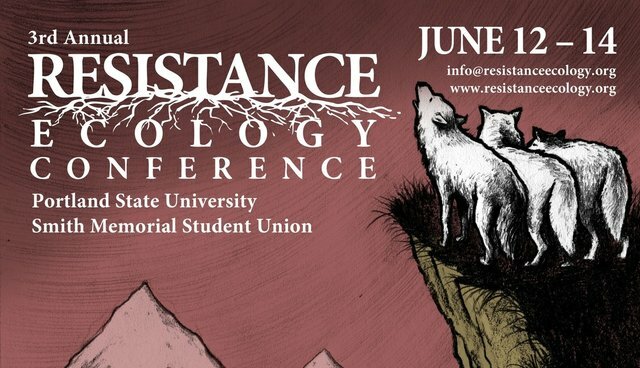 For two years, the Resistance Ecology Conference has served as a beacon on the path to grassroots animal liberation. We aspire to create a forum to unite animal liberationists, land defenders, and organizers to share skill sets and resources, to report and recruit, to coordinate campaigns, and to promote solidarity, coalition organizing and mass movement building against the structures that underpin animal use and ecological destruction on the continent- Euro-settler colonialism, white supremacy, patriarchy, capitalism, neoliberalism, and border imperialism. We challenge the professionalization, corporate assimilation, consumer-orientation, and one-dimensional analysis of the so-called animal "rights" movement in the west that is founded in positions of social power and is made possible through colonialism, capitalism, and patriarchy. The goal of the conference is to identify these analytical and structural barriers within the animal liberation movement as barriers that prevent us from creating the radical analysis, solidarity, and mass movement necessary to affect meaningful change for animals. If you are interested in presenting or tabling, please get in touch sooner rather than later so we can make arrangements. If you are interested in volunteering, get in touch! We can plug you in! More information on speakers, sponsors, workshops, etc. will be forthcoming soon. Until then, mark these dates down in your calendar and start making all the necessary arrangements! Please help promote, invite, and share.